It could be as early as next week that the farmer from Bedford outside Port Elizabeth is voted out of his post. 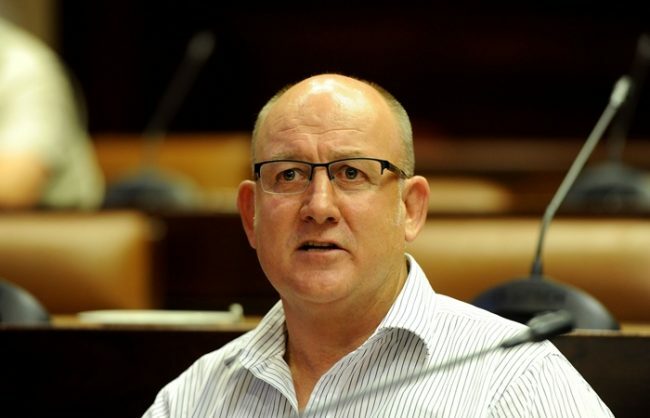 A subdued Nelson Mandela Bay metro mayor Athol Trollip was not as confident as previously yesterday, even though he dismissed the latest move by the alliance of opposition parties in the council to oust him from the hot seat. It could be as early as next week that the farmer from Bedford outside Port Elizabeth is voted out of his post as all his foes in the council have closed ranks against him. He was saved from the axe earlier this year when one of the parties now in the opposition alliance came to his rescue, voting for him to stay in power with its single king-maker vote. This week the ANC, Economic Freedom Fighters (EFF), Patriotic Alliance (PA), United Democratic Movement (UDM), African Independent Congress (AIC) and the United Front agreed to put aside their political differences and cooperate to remove Trollip through a motion of no confidence. The parties met in Port Elizabeth on Thursday to devise a joint strategy. The DA had been at the helm of the hung council with its 57 seats and one each from Congress of the People (Cope), the African Christian Democratic Party (ACDP) and the PA. The opposition had been attempting to lure the PA away from the DA-led coalition on to its side by offering its lone councillor, Marlon Daniels, the crucial mayoral post, which he had not taken. This week, Daniels, who is the member of the mayoral committee for roads and transport, indicated he would no longer support the DA coalition as it did not benefit his community. Previously, an EFF attempt to remove Trollip through a motion of no confidence had failed because the PA sided with the DA to oppose the move. The DA was also backed in that instance by Cope, the AIC and the ACDP. EFF leader Julius Malema said they wanted to punish Trollip specifically for the DA’s opposition to the EFF-initiated motion on land expropriation without compensation. Now the ruling coalition is shackled by the loss of support from the PA, whose councillor, Daniels, is unhappy with service delivery by the metro under Trollip. Sources within the DA said Daniels had demanded that the metro should prioritise the coloured northern areas at the expense of other black townships. The source said the metro had been involved in a number of projects to improve the townships. PA leader Gayton McKenzie accused the DA this week of evicting only black and coloured residents while the UDM’s Mongameli Bobani said service delivery was not happening under the DA and water and electricity tariffs had increased dramatically. Approached for comment yesterday, Trollip sounded down. “There is nothing new; the motion was there before, we are not even going to respond to this. I have no mandate to respond to something like this,” he said. Bobani said they would submit a petition to metro speaker Jonathan Lawack, requesting he schedule a council meeting before next week. Both Bobani and Daniels have now expressed interest in becoming the next mayor should Trollip be ousted. It has also been said that the ANC’s Bicks Ndoni is keen to take over. Observers see this as a potential cause for division in the new opposition alliance.